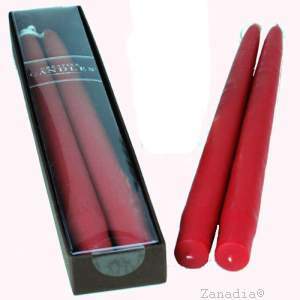 Creative Candles Taper Boxed Pair-Red 7/8X12. Dripless and Smokeless. The highest quality taper candles. Individually made by candle artisans in small batches using pure cotton wicks and the finest blend of waxes. These Taper Candles have graced tables at the White House, Lincoln Center, The Waldorf-Astoria, and countess weddings, galas and dinners for Royalty, as well as many celebrity parties and special events. Each Taper set comes with a 4 X 3/4 inch strip of soft beeswax. Wrap around candle base to secure into oversized candle holders..